I have a couple of essays in this publication from LSU, and am honored to be among such august company. 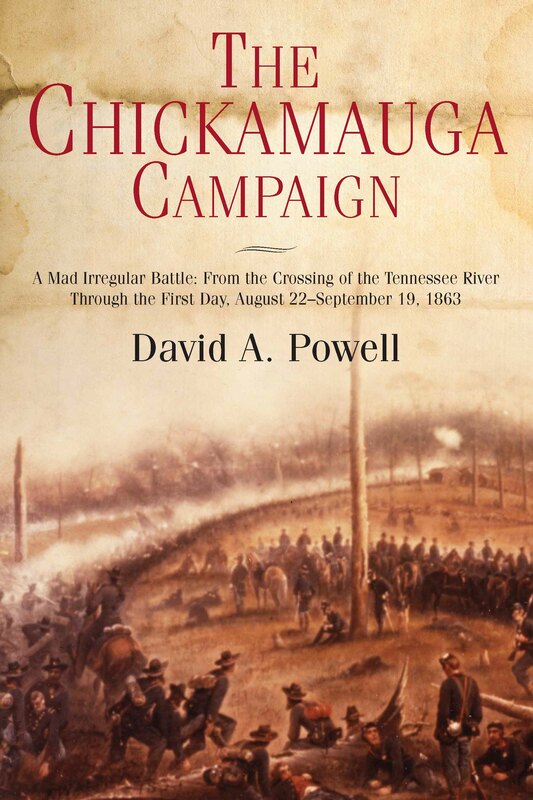 I have seen some of the other work included, and I think that this is going to be a very worthwhile new addition to the study of the Campaigns for Chattanooga. 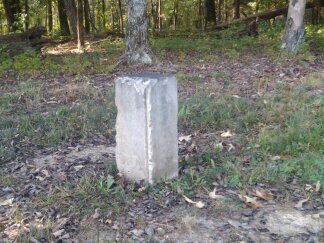 Below is a picture of one of the more important markers on the Chickamauga-Chattanooga National Military Park. It doesn’t look that important, but it and several others of its kind tell us a great deal about the battle. Some of you, I am sure, recognize this stone (at least the type) right away. Robert and Brad pegged it – this is a field corner marker, and Brad also nailed the location – Winfrey Field near the Baldwin Mortuary Shell Pyramid. These field corner markers were placed soon after the park was formed, in order to permanenty record the shape and size of the fields. They are important pieces in defining the physical space of the battlefield, and knowing what the historical fields should have looked like is very helpful in understanding many accounts from participants. A number of them have been lost over the years, but there are still several around. On almost every tour, someone asks what they are. Some have been asking about pre-orders. Savas-Beatie will be setting up a pre-order process. There are a couple of ways to go about it. First, go to www.savasbeatie.com and put your email in the top left box for the Savas-Beatie monthly e-letter libri novus. This is the best way to stay informed on all S-B releases. to the printer and you can pay at that time. Finally, there will be an icon going up this month on the S-B website (www.savasbeatie.com) with a “reserve now” button that will do the trick as well. Seminar in the Woods, 2014 – March 7 and 8, 2014. CCNMP Study Group 2014 Seminar in the Woods. Date: Friday, March 7, and Saturday, March 8, 2014. Friday: 8:30 a.m. to 5:00 – George Thomas and the XIV Corps advance to Chickamauga. We will not be returning to the Visitor’s Center for lunch, as this would take at least an hour out of the day. Instead, we will stop in downtown Chattanooga, or at Trenton. This means that whatever you need for the day, be prepared to bring it with you. We will not have access to the cars at lunch. In the afternoon, we will cross Lookout Mountain, and follow Thomas’s corps into McLemore’s Cove and then on to Crawfish Spring, in the town of Chickamauga. Saturday morning we will return to the vicinity of Jay’s Mill and Winfrey Field, to explore the developing fight on September 19th. Our primary focus will be on Brannan’s engagement with Wilson’s and Ector’s Brigades of Walker’s Confederate corps, Baird’s entry into the fight, and Liddell’s counter-attack. Meet at the visitor’s center, and then car-caravan to Jay’s Mill Road. Saturday Afternoon: 1:30 p.m. to 5:00 p.m. Gordon Granger and the defense of Horseshoe Ridge. We will finish our tours on Horseshoe Ridge, following the Union Reserve Corps onto the battlefield and describing the ensuing action. We will focus primarily on that part of Horseshoe Ridge beyond Hill 3, out to the end of the Union line. Meet at the visitor’s center, and then car-caravan to Snodgrass Hill. Lodging and Meals: Everyone is responsible for their own lodging and meals. There are many hotels in the greater Chattanooga area, to fit most any price range. The closest are in Fort Olgethorpe, Georgia, with the least expensive in Ringgold. Each tour on Saturday is designed to leave at least 90 minutes for lunch, and there are several family and fast food restaurants within minutes of the battlefield. There are designated picnic areas near the Visitor’s Center, for those who wish to bring a lunch and eat on the field. White, William Lee, Bushwacking on a Grand Scale: The Battle of Chickamauga, September 178-20, 1863. Savas Beatie, 2013. An excellent new introduction (at 162 pages, profusely illustrated) to the battle of Chickamauga by Park Ranger Lee White. Note: Friday’s Tours will be by Bus, as we move from site to site. While the tour itself is free, we do have to pay for the bus. Please also note that bus costs have risen a bit in the past couple of years, so we now must adjust the fee accordingly. I will hold your payments. If you pay by check, Please make that check PAYABLE to DAVID POWELL. note that I will not cash those checks until we have sufficient entries, so that if we have to refund, I will simply send your checks back to you. Any monies collected over and above our expenses are always donated to the park, either to the monument repair fund or as donations to the park library. The first volume’s subtitle will be: “A Mad, Irregular Battle” – a quote from General John B. Turchin’s book describing the fighting on the 19th.